A long time ago I stopped wasting time being overwhelmed by all of the different advertising and marketing opportunities. Instead I invested my time in developing 2 strategies to guide my marketing choices, they’re so simple and effective I just had to share them with you! 1) Will it provide exposure to my ideal clients? 2) Will it help me achieve my marketing goals? 3) Is it worth the dollars I am investing? If you can answer “Yes” to all three questions, and you have the marketing budget available, then go for it!!! If your answer is “No” to the first two questions, you need to walk run away, from that particular marketing opportunity. But having gone over these questions more than a few times with my clients, I’ve found that most people have a combination of answers. In a recent coaching session, a client answered “Yes” to the first 2 questions, but “No” to the third. Did I tell her to walk away from the deal? No! This was a profitable marketing opportunity which would put her in front of her ideal clients and accomplish her marketing goals; the problem was the price. I encouraged her to go back and negotiate for a lower price. If you are spending your marketing dollars on a strategy that is not putting you in front your clients, helping you achieve your goals, or sucking your business dry; you are wasting money on marketing! Client Mapping leads you straight to the source of your ideal client. You can easily see which marketing strategies are working and continue to grow and nurture those. You can also see which one’s aren’t profitable and stop wasting time investing in them. 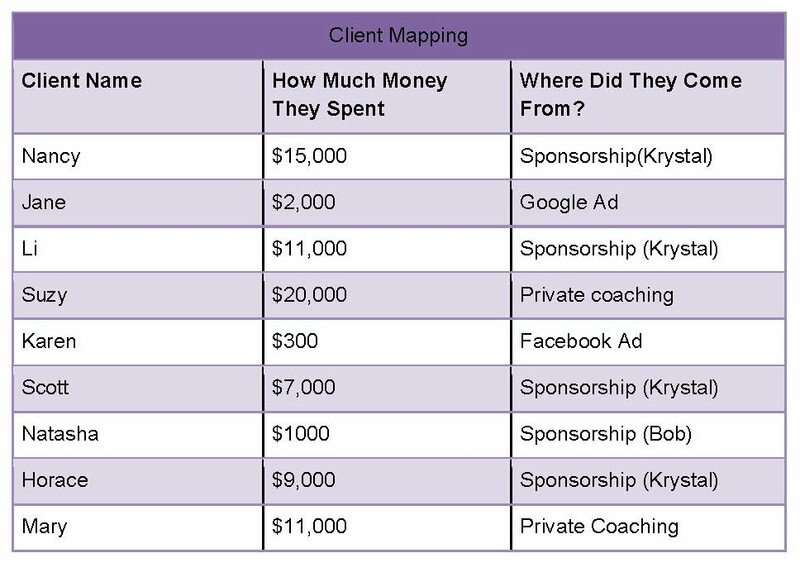 In the example above you would definitely want to reinvest in another sponsorship with Krystal, Do you see how important it is to know where your customers are coming from? You can stop wasting time on marketing by following this map directly to your ideal client and the strategies that are actually working in your business. 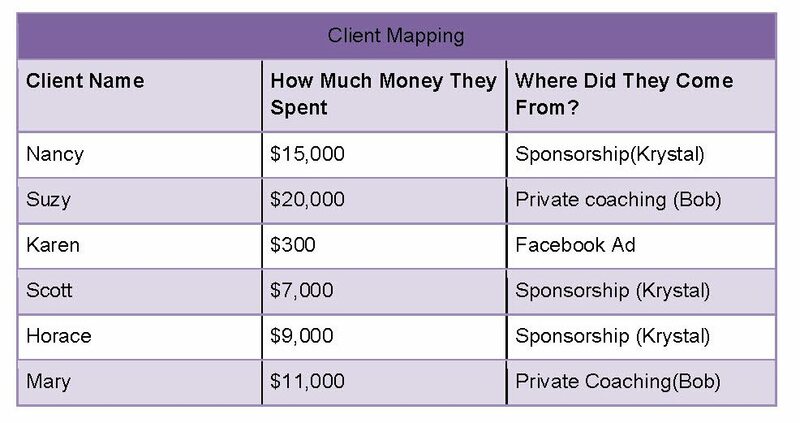 Client Mapping is a powerful strategy; let me know how it works for you! As an entrepreneur you get to choose who you work with. Choose well! Want to get clear on how you can market your business? That is exactly what I taught during my Business Building Bootcamp on June 9th, 2016. For more information and to request access to the video replay click here. Excellent advice, Michele! After years of letting people (some “friends”) convince me that I just HAD to place an advertisement in their event booklet or directory to reach “X” people, I quit – cold turkey. Advertising and marketing for no reason other than friendship is just plain stupid. Your business is your life. Using a tight marketing budget to make donations is just bad business. Strategy needs to be used in all phases of any smart business to achieve growth and success. You are right, sometimes it is difficult to lob those non-ideal customers off your list – especially those that have been responsible for significant revenues. Any revenue earned through nightmare relationships is not worth any amount of money. Get rid of the headaches, heartache and heartburn and enjoy your customer relationships. Great advice. I will do this exercise immediately. Michele I strongly agree with your direction and advice. I am curious, what is your philosophy in working with internet advertising or social media advertising (i.e. FB post boosting, etc.)? Hi Sara – I am a huge believer in internet and social media marketing. What you have to get clear on is that online marketing works best when you use it for visibility. So you don’t see a lot of direct sales from a Facebook ad for example. What you want to do most of the time is use those to drive people to a free webinar or report and then have a conversation with them about your products or services.